The 89 guestrooms and 12 suites at La Bagnaia Golf & Spa Resort Siena, Curio Collection by Hilton are set across various buildings to preserve the atmosphere of the original village (borgo). Set in different areas are the Borgo Bagnaia, based in the main resort area, and Borgo Filetta, located one km away near the Buddha Spa. Each room features selected art, tapestries, and antique furnishings to create an exclusive, inviting space to enjoy fresh morning breezes and star filled evening skies. 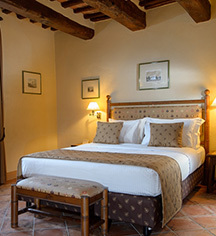 Experience total relaxation in one of the spacious twin, double, or queen rooms, featuring authentic Tuscan design and enriched by select materials, such as fine linens, wood ornaments, and authentic furniture. Enjoy a 40-inch HDTV, minibar, safe, air-conditioning, and complimentary WiFi. Refresh in the bath with deluxe bath products, hairdryer, cozy bathrobe, and slippers. 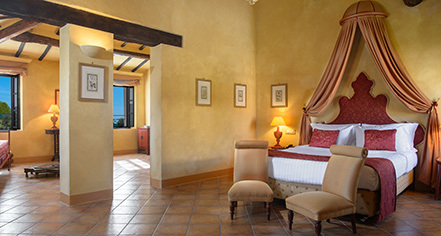 Suites offer a separate living area with magnificent views of Siena and the Tuscan hills. Each suite is uniquely designed with the finest fabrics and carved wood ornaments, and include air-conditioning, complimentary WiFi, 48-inch HDTV, and minibar. The elegant bath boasts deluxe bath products, a hairdryer, cozy bathrobe, and slippers. Accessible guestrooms feature all the amenities of the standard guestrooms, along with thoughtful extras like a wheelchair-accessible bath with roll-in shower to ensure a comfortable stay.